Participating in architectural design competitions is a major way for designers to demonstrate their design ideas and realize their professional dreams. To help designers make their voice heard, Aimir CG would often share useful information on architectural visualization contests and events at home and abroad in our blog. University students specializing in urban planning, architectural design, landscape design, and art design at home and abroad are free to register and participate in individual or team forms. Each group shall have no more than five members, no more than two instructors, and a team leader. This competition is an integral part of the Second Hebei International Urban Planning and Design Competition. 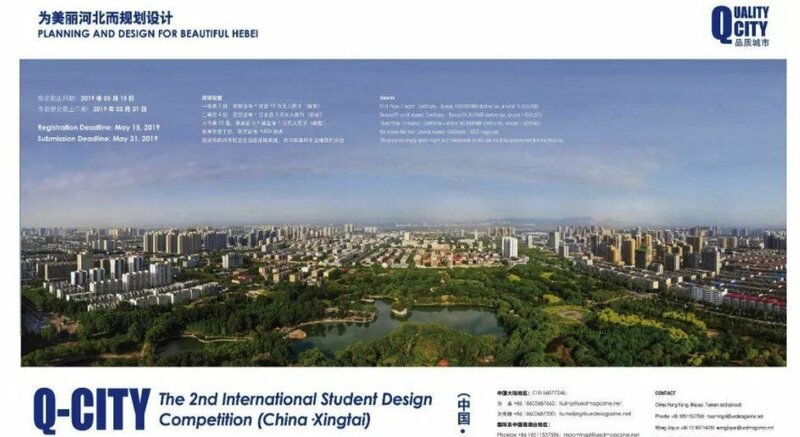 Planning and Design for Beautiful Hebei-The Second Q-CITY International College Student Design Competition is aimed to transform and improve the quality of the city. Through the new humanism spirit, it explores the ideas and methods of urban micro-renewal and strives to enhance the value of existing elements through limited investment, accurate design, and consistent implementation strategies, and produces huge benefits with tiny intervention. The competition among cities in the future will no longer be limited to the traditional mode and direction. This “Quality City” competition is an exploration and attempt of the transformation of urban public space. The “Quality City” is intended to further enhance the taste and connotation of the city, demonstrate its inner potential at a deeper level, integrate its spirit and culture into its material construction and development, and form a spiritual essence that reflects the characteristics of the city. Based on the environment of Xingtai City with both historical heritage and development potential, this international competition recruits creative urban micro-space renewal programs from college students specializing in urban planning, architectural design, landscape design, art design and other directions at home and abroad. The contest covers urban repair functions, health sports facilities, smart city furniture, public art sketches and other buildings that can stimulate the vitality of the city, providing a new perspective for the rich daily life. The winning works will have the opportunity to be implemented locally by the local government. The IAI Design Award is a recognized symbol of international creativity and design. At the same time, the winning works will also receive the greatest range of promotion and recognition. Therefore, winning the IAI Design Award has become a proud honor for every designer. If you want to know more about the participation method and detailed information, please feel free to contact us and we will reply you in 24h. Aimir CG would be glad to inform you of all kinds of design events and help you address the challenges of taking part in these competitions and contests. Don’t worry, the consultation would be completely free.